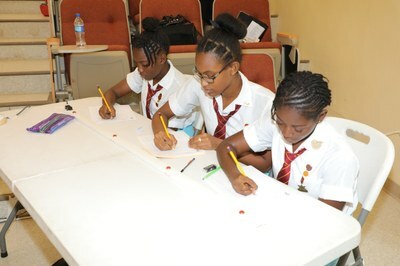 Glenmuir High and Immaculate Conception High to square off in Finals of Inaugural UTech, Jamaica Mathematics Quiz Competition — UTech, Ja. 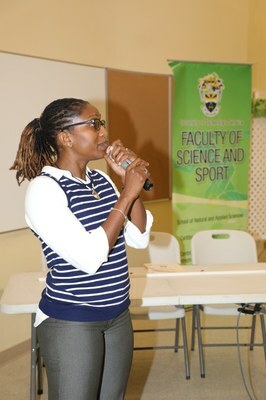 Dr. Kamilah Hylton, Dean, Faculty of Science and Sport speaking at today’s semi-final round of the University of Technology, Jamaica Inaugural Mathematics Quiz Competition held at LT 50, Shared Facilities Building, Papine campus. The five high schools from the preliminary round held on Saturday, November 18, 2017 - Campion College, Herbert Morrison Technical High, Immaculate Conception High, Glenmuir High and Wolmer’s High for Girls competed in today’s semi-finals held at the University’s Papine Campus. 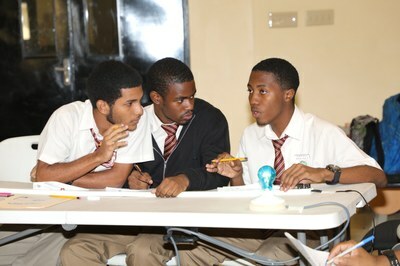 Twenty-one high schools participated in the competition. After today’s semi-final round comprising a written paper and two enthusiastically contested live matches among the five teams, the emerging top two schools from each match were Glenmuir High School with 52 points and Immaculate Conception High School with 54. The two schools will compete in the final round to be held tomorrow, Thursday, November 30, 2017 at LT50, Shared Facilities Building at 10:30 am. The final match will be preceded by an opening ceremony beginning at 10:00 am. 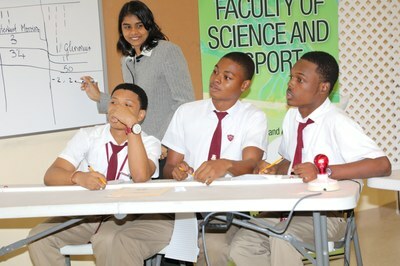 High school teams in competition in today’s semi-final matches. From top: Glenmuir High, Wolmer’s Girls, Herbert Morrison Technical High, Campion College and Immaculate Conception High School. President, UTech, Jamaica, Professor Stephen Vasciannie, CD (centre) is all smiles as he congratulates participating team members from Campion College, (l-r) Clinton Reid, Tamoy Seabourne and Rritu Kunchakuri and from Immaculate Conception High School, Anika Duffus, Sharmalee Wright and Athena Pagon. 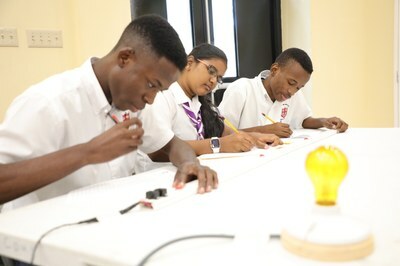 President Professor Stephen Vasciannie, CD (Centre) poses with students from Herbert Morrison Technical High School, Montego Bay. Mathematics teachers/coaches from Glenmuir High School Miss Oneika Anderson (centre) and Mr. Andrew Gordon pose with their students.